(HOST) Commentator Olin Robison says that European perceptions of the U.S. can be surprising, instructive and occasionally entertaining; recent case in point: Mr. Brown at the White House. (ROBISON) When the leader of another country visits the White House it is a Big Deal. It is, of course, a bigger deal for the visitor than for the host but that really is the way it is. The most recent example of all of this was some days ago when Gordon Brown, The Prime Minister of Great Britain, came calling – by invitation, of course. The newspapers in London parsed every utterance, every gesture, every word. 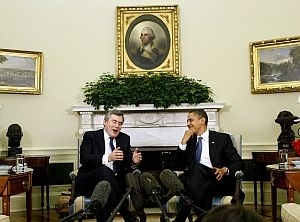 Much was made in London of the fact that Gordon Brown was the first European leader to visit the new President. You may rest assured that there would have been similar press gloating in Paris, Berlin or Rome had the first European to cross the Atlantic been Sarkozy, Merkle, or Berlusconi. President Obama has already met with the leaders of both Canada and Mexico. This has long been and will probably will long remain common for a new president. After that, however, you may rest assured that Ambassadors in Washington are currently in a serious competition to have their leaders invited as soon as is humanly possible. In the department of word analysis, London newspapers took special note of the fact that the "special relationship" had been "downgraded" (their word, not mine) to a "special partnership" in Gordon Brown’s conversations with the President. I personally thought that it was an upgrade but what do I know? The London papers similarly analysed the gifts each First Lady gave the other for the children; noting, for instance, that Mrs. Brown had gone to a lot of trouble in choosing exactly the right gifts for the Obama girls while Mrs. Obama had simply procured gifts for the Brown boys (there are two) from the White House gift shop. All of this was taken to have special meaning. Mr. Brown is in trouble back home and at least one London newspaper speculated in large headlines as to whether this visit would give Mr. Brown an "Obama bounce". Really, I’m not making this up. It is certainly the case that at the moment Mr. Obama is enjoying not only great popularity at home but overseas as well. How long that will last is anyone’s guess but in all likelihood it will correlate closely with the economy. If the current White House efforts to stimulate the economy work, the popularity will probably continue. Otherwise, probably not. In the meantime, please pay attention to who visits the White House next, and then after that. Then, if you have access to a computer, check out the newspapers online from that leader’s country. Chances are, we will see it happen all over again – and again, and again.